Lew Cody, whose performance in SOULS FOR SALE gets hammier each time he appears. The above image catches him at the midpoint between Act 1 restraint and Act 3 barnstorming. 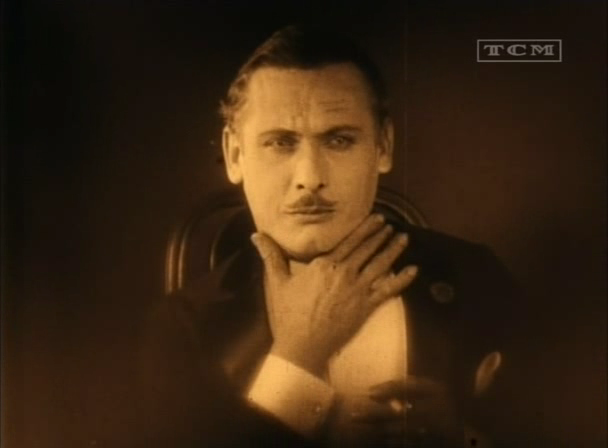 I’m still wittering on about SOULS FOR SALE, mainly because I’ve been so busy (mostly with unproductive busywork) this week that I haven’t seen any more silent films. Still, this one is a doozy. 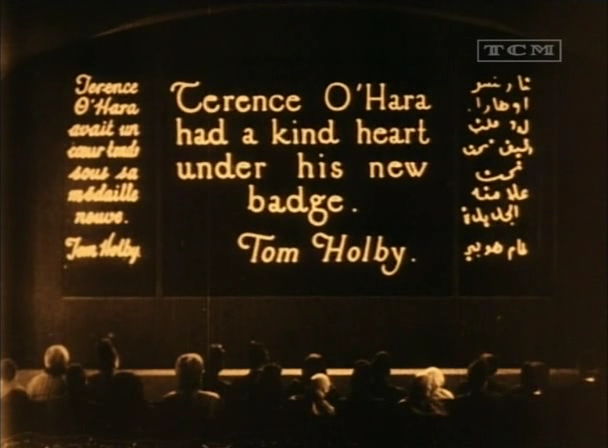 So what we have here is a trilingual intertitle from a film within a film. Some novelty value there, I’d say. Don’t say you don’t get your money’s worth. I’ve never seen a film in Egypt but I did see GHOST IN THE SHELL in Marrakech, which was an interesting experience. A movie ticket is very cheap in Morocco, so people mainly go for the air conditioning, to talk in the comfort of a cool, shaded environment. They not only do not switch off their mobile phones, they answer them and have long talks while the film is in progress. This wasn’t as distracting as it might have been, since absolutely everybody was doing it, all the time. Still, I wouldn’t really want to be a filmgoer in Morocco, since the kind of immersive experience I seek in a movie wasn’t really possible there. This was at the Marrakech International Film Festival, an extraordinary beanfeast which I shall tell you all about another time.